Some of the blockchains that are in the top 20 do not belong there. After analyzing the Github repositories for developmental output in 16 of the top blockchains, it has become clear that some haven’t been working too hard over the last few years. There is very little time for anyone to do in depth analysis on many of the current blockchain protocols. Most of us just skim our information from the easiest sources, such as Twitter — where it takes all of 5 seconds to blast off a tweet for all to indulge. This data was collected by querying the Github GraphQL API, which exposes all the commit, pull request, and issue data. Which blockchains have a robust, upward trend in development — a very good signal! The long term commit history of 16 of the top blockchains. Unique contributors to each projects code, another indicator of good health for an open source project. The chart below considers unique contributions since the inception of each blockchain. A unique contribution is a single Github user interacting with the code repository in an Issue, Pull Request, or Commit. These scores are combined in all three categories, and their points are weighted and tallied. Note these values are weighted. The actual number of people who have contributed are less than what is shown. For unique contributions, obviously Bitcoin is at the top, since it has been around the longest. But it is important to see where some of these projects land. We see some weak looking projects at the right side. These blockchains have had very few individuals interact with the code, and some of been around for many years…. Not a good sign. Another interesting point is how strong Bitcoin and Ethereum (go-ethereum and parity-ethereum) are compared to the rest of the pack. 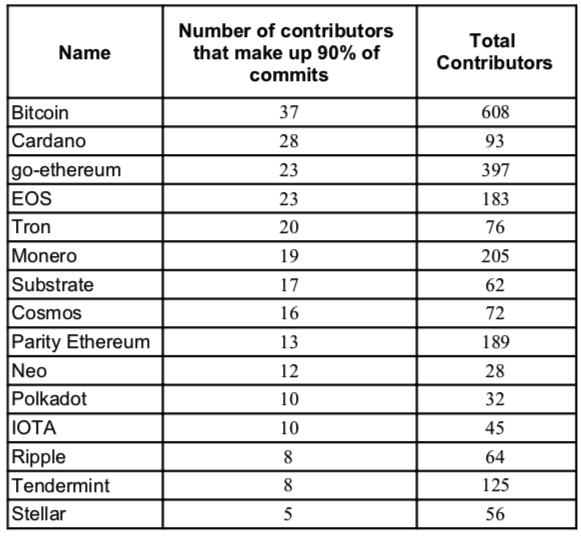 They each have the most unique contributors, with the longest history. The momentum they have will be very hard to knock off. Let’s now focus on recent data. This is the same data as above, but we are focusing on the last 14 months. A surprising fact was how many unique Github accounts have contributed to EOS. I have to admit I’ve been out of the loop on EOS. I thought their $4 billion dollar ICO was ridiculous, so I didn’t pay too much attention. I don’t know too much about the development community, but I expected it to be much more centralized in development. Similar to where Tron is on the chart. Both projects have similar amounts of commits, and were started at roughly the same time, but Tron has had way fewer unique developers contribute to its source code. Maybe EOS hired a ton of people with the $4 billion dollars they raised, or maybe there is real open source contributions happening here. More in depth analysis would need to be done. Cosmos and Polkadot get more representation in this chart, which makes sense since they are both launching this year, and will be pushing many commits before going live — a common pattern among launching blockchains, which we will see below. We see again that Iota, Litecoin, Ripple, Stellar, Dash, and Neo are not really doing that much development work. This is a combination of Issues, Pull Requests, and Commits, over the last 14 months. Of the mature projects, Bitcoin, Monero, and Ethereum all show that that they are still consistently pushing code. We see EOS, Cosmos, and Tron having large pushes over the last 14 months. Cardano is up there too. It might seem surprising to many in the Ethereum community that Tron and EOS have this much development work, but it is true. Their repositories had heavy development before launch. This isn’t the whole story though, as we will see in the next section. Below is a chart of commit history in each repository. Each months commits are summed together, giving 12 data points per year. The chart is very hard to read within Medium, it is highly recommended to click through and go to the interactive chart, and click on “Full Window” mode. While interacting with the chart on Plotly, I recommend keeping Bitcoin and go-ethereum highlighted, while turning on and off every other blockchain project to see how the commits compare. This will allow you to compare the development of all the other projects to the top two blockchains. Bitcoin’s trend of commits is consistently upward and to the right. This shows how reliable the continuous development of the protocol is, and it is one of the main reasons it is the most relied upon blockchain in the world. Go-ethereum had a massive spike before launch and has since dropped off. There is also a huge spike for parity-ethereum right after the go-ethereum spike, which is a nice sign, since both clients are important to the protocol. But this goes to show, big spikes, with big drop offs, are expected after a network launches, and can still lead to a successful blockchain. EOS, Cardano, and Tron have all fallen off massively since their initial pushes for their launch. However, since Ethereum had this exact same situation, this isn’t enough to criticize them. A much better way to compare these projects would be by how many smart contracts are being built on each of them. Monero is also up and to the right, more so that any project except Bitcoin. This is a good indicator for Monero. Comparing privacy coins, Zcash has less overall development work and less unique contributors. I would take Monero over Zcash. Polkadot is coming up this year for a launch. It would be expected that they have a big code push in 2019. Cosmos had a big push the last few months of 2018, and it has fallen off in early 2019 as they are currently in audit mode. Both of these projects have a lot of promise, but it shouldn’t come as a surprise when we see them drop off as well. Iota, Dash, Stellar, and Ripple have poor development over the last few years. They also have very low unique contributors. This points out that they aren’t doing much development themselves, and they aren’t doing a good job at building a decentralized community of developers. It is not so clear why these are valued so highly. Ripple isn’t a real blockchain, but still, the Github commit trend line is the worst of them all, a complete and total disaster! I never looked into Litecoin much before this. For development, it seems almost non-existent. It followed Bitcoin almost exactly, up until mid 2017. Since they broke from following Bitcoin, the commits have fallen off extensively. It isn’t clear why this coin is worth anything. I even doubled checked all their branches, and all of the people in the organization — no one has written any code since October 2018…. Is it possible to short Litecoin? (Seriously, let me know in comments). Neo is the saddest project of them all. The commits are so few. And there are very few people who have ever contributed to this repo. I have to admit, I fell for “China’s Ethereum” a few years ago and I thought this was a serious project. What a great framing that was! However it is clear as daylight that not a lot of work has been done here, and that this project was never serious from the start. You can now call Tron “China’s Ethereum”. Lastly, a simple table that looks at how many unique contributors make up 90% of the commits. You want to see a high number here, as it means more people have put in real work into developing the blockchain core software. Note Dash, Zcash, and Litecoin were left out because so many of the commits mixed and matched with Bitcoin core contributors, since they were all forks of Bitcoin. However, many of these blockchains have employees as contributors, rather than open source developers, which could represent the bulk of commits, which is not as robust as open source development. Once again Bitcoin takes the cake here, with the most contributors, and the least employees. Bitcoin is robust as hell, and I would not bet against it. The “Bitcoin is old technology” narrative will rear its ugly face again in the next bull run of Alt Coins. Remember how consistent Bitcoin has been over the last 10 years, as this will remind you how hard it will be to dethrone Bitcoin. There are some really crap blockchains that have big market caps (Litecoin, Neo, Iota, Dash, Stellar, and Ripple). EOS, Tron, and Cardano have had a lot of development over the last two years. It is now time for their platforms to prove themselves. Monero has good, consistent development. Remember, this is just high level analysis of data points on Github. No in depth analysis of the code has been done. Having lots of commits does not mean the code quality is good! The next blog post I am going to do will focus on smart contracts being developed on blockchains such as Ethereum, EOS, Tron, etc. It is expected that Ethereum will have the most here, but I am very interested to see how some of these other projects are doing. Most of my information end up coming from the Ethereum community, so this data should be very eye opening to myself, and many in the Ethereum community. Any project that was a fork of Bitcoin (Zcash, Dash, Litecoin) has had their commit history altered to start from the point at which their commits started to diverge from Bitcoins significantly. Cosmos and Tendermint have been combined as one project, even though they are two seperate repositories. So has Substrate and Polkadot. Both repositories are core to each blockchain, which is why they were combined. Parity-ethereum and go-ethereum clients have both been included in the data. Ethereum is the only blockchain with two clients that both have wide usage, which is why they were both included. EOS, Tron, Dash, and Cardano have a lot of commits on their “develop” branches, so these were used, rather than “master.” (Recently on Twitter it was being passed around that EOS’s development has completely fallen off. This is only partially true, after looking at the develop branch).